SONNY BILL OR MONEY BILL? Well we all knew SBW was coming back to Rugby League at the very start of 2012 with the Roosters for 2013 (and in fact once his Canterbury-enforced exile from 2008-2012 ended, he had been fairly open with the idea of returning), but on Tuesday he 'officially' signed a deal with the Roosters that will tie him to the Sydney club for all of... one season. Translation: SBW is back in Rugby League but he's not going to be tied to any NRL club for any longer than he wants to be. That seemed to be the under-current of his decision to walk out on the Canterbury club back in 2008 - just one year into a five year contract that paid him roughly $400-450,000 per season. And as we discussed back in January - SBW has been the big benefactor from his walk-out on the Dogs, he's made oodles of cash and traveled the world being revered in another code... #winning. But now he is back (well once he recovers from a torn right pectoral suffered playing Japanese Rugby) - does it really matter if he's here for one year or five years? The game benefits from his return because of his 'story' and his undeniable pure footballing ability, while the fans get to welcome or boo him back... and the only place you can do either is AT the game. So at least for the first few weeks of the season, the Roosters should draw great crowds at the SFS and their road games should get a boost as people flock to tell SBW what they think of him (but hopefully just watch him play). The downside for those who want to welcome him back negatively is the guy can flat out play footy, and no matter how much you might loathe his decision making - his footy will do more as a comeback than any amount of talk from him can. "This is going to be one of the biggest challenges of my career," Williams told the press conference at Roosters HQ. "A lot of people will be writing me off. Every time I step on that field there will probably be a target on me." Now that's a nice thing to say SBW... but it's just talk at this stage, and 'a lot of people' is a generic term that half the time individuals use to motivate themselves, rather than the individual actually having 'a lot of people' hoping he fails. Sure, there will be naysayers but why should SBW care about what they say now? 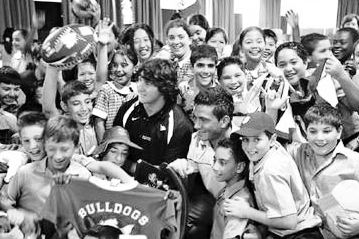 Anyhoo, I for one am very glad to see him back in the NRL. Roosters Chairman Nick Politis is also grinning from ear to ear after making this handshake agreement with SBW a number of years ago (according to Williams) and seeing the 27 year old stick to it. On the field - the Roosters get a player who can change games, they still need Mitchell Pearce to win games for them but the biggest advantage of SBW joining them in 2013 is that James Maloney will be doing the same for the new season. And having seen what Maloney can do running off Feleti Mateo at the Warriors, how good could be he running off SBW at the Roosters? There is a downside for the Roosters though, they have to remember that defence is a huge part of the game and though SBW is a big hitter - the attitude shift that new coach Trent Robinson must enforce in defence is long overdue. Though former coach Brian Smith did a wonderful job offensively with the club as they played freely at times - esp 2010 - the team just switched off defensively far too often in the years that followed. So we get SBW for 2013... maybe not a season more, but really does it matter if he flirts with Rugby League again? He's going to be must-see commodity on the field (and on the TV) and that makes his return a huge boost for the game, the Roosters but funnily enough - maybe not for himself. Especially if boxing is where he thinks his long term future is... but who cares, SBW is back - so let's enjoy him playing in the NRL while we still can. And another thing... The Roosters open the season at home against the Rabbitohs on Thursday March 7 at the SFS, they then travel to Auckland to play the Warriors in Round 2 - with the SMH's Brad Walter reporting the Warriors are strongly considering moving their game to Eden Park from Mt Smart Stadium to cater for the larger crowd that SBW will pull. 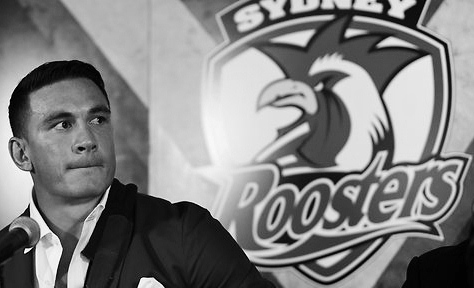 So how will Sonny Bill Williams fare in 2013 with the Roosters? Can he challenge Ben Barba, Cooper Cronk or Greg Inglis for the 2013 @NRLTweet Player of the Year Award? Review all of the voting results from 2012 right here.